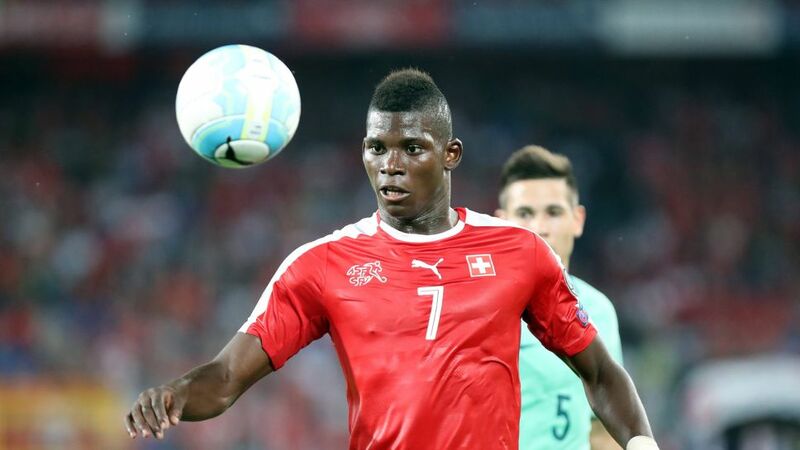 FC Schalke 04 striker Breel Embolo was on target as Switzerland stunned UEFA EURO 2016 winners Portugal 2-0 in 2018 FIFA World Cup qualifying. The Bundesliga may only be one Matchday old, but already there is a break for international matches. 2018 FIFA World Cup qualifiers and an array of friendlies are on the agenda for many Bundesliga players, who are keeping fit with their countries ahead of Matchday 2 on 9-11 September. Remember, there is still time to sign up to Official Fantasy Bundesliga. Do not delay, click here to get involved today ahead of Matchday 2! bundesliga.com rounds up all of the international action with Bundesliga involvement during the first international break of the season. Borussia Dortmund starlet Christian Pulisic played a pivotal role in the victory that secured top spot for the USA in their semi-final qualifying round. Making his first start for the USMNT, the 17-year old set up the second goal and created a host of chances as the home side cruised to victory. Hamburger SV's Bobby Wood and Fabian Johnson of Borussia Mönchengladbach were also in the starting line-up. FC Augsburg pair Koo Ja-cheol and Ji Dong-won started as South Korea were held to a goalless draw in Syria in the Asian section of FIFA World Cup qualifying. FC Ingolstadt 04's Mathew Leckie and Bayer 04 Leverkusen's Robbie Kruse formed two of Australia's front three as the Socceroos won past the United Arab Emirates 1-0 in Abu Dhabi. The Australians are top of Group B, five points clear of Jordan. Borussia Dortmund starlet Ousmane Dembele earned his second international cap for France, coming on for the final 20 minutes as the UEFA EURO 2016 hosts and finalists were surprisingly held to a goalless draw by Belarus in Borisov. Borussia Mönchengladbach defender Oscar Wendt and RB Leipzig winger Emil Forsberg started on the left flank for Sweden ad the wrested a Netherlands team featuring VfL Wolfsburg centre-back Jeffrey Bruma to a 1-1 draw in Solna. All three Bundesliga players played for the duration. A clean sheet for RB Leipzig goalkeeper Peter Gulacsi was scant consolation for the Hungarian shot-stopper as his nation were surprisingly held to a 0-0 draw away to the Faroe Islands. SV Darmstadt 98 Laszlo Kleinheisler also started, with TSG 1899 Hoffenheim striker Adam Szalai introduced from the bench early on. FC Schalke 04 summer signing Breel Embolo and Bayer 04 Leverkusen forward Admir Mehmedi were both on target as Switzerland got their 2018 FIFA World Cup qualifying campaign of to a flying start with a 2-0 win over European champions Portugal. Yann Sommer (Borussia Mönchengladbach), Johan Djourou (Hamburger SV), Ricardo Rodriguez (VfL Wolfsburg), Fabian Schär (TSG 1899 Hoffenheim) and Haris Seferovic (Eintracht Frankfurt) also started for the hosts in Basel. Borussia Dortmund's Raphael Guerreiro featured for 90 minutes at left-back for the vanquished Portuguese. 1. FC Köln centre-back Mergim Mavraj and SC Freiburg midfielder Amir Abrashi started as Albania beat Balkan neighbours FYROM 2-1. Veteran Hamburger SV defender Emir Spahic bagged his first international brace as Bosnia-Herzegovina cruised to a 5-0 win over Estonia to surge to the top of Group H. Hertha Berlin striker Vedad Ibisevic also found the target in a match which featured Schalke 04's Sead Kolasinac at left-back and TSG 1899 Hoffenheim's Ermin Bicakcic from the bench. Borussia Dortmund centre-back Sokratis put in an imperious display as Greece beat Gibraltar 4-1 at the Estadio Do Algarve. The reigning South American champions, with Bundesliga stars Arturo Vidal, Charles Aranguiz and Eduardo Vargas in the starting line-up, were left frustrated as unfancied Bolivia clung on for a draw in Santiago. TSG 1899 Hoffenheim striker Vargas had the best opportunities to break the deadlock, but was foiled twice in quick succession just before half-time. FC Bayern München all-rounder David Alaba provided the assist for new FC Augsburg defender Martin Hinteregger to open the scoring on 16 minutes for Austria, en route to a 2-1 triumph. New Bayer 04 Leverkusen midfielder Julian Baumgartlinger captained the side, while a several other Bundesliga stars, including FC Schalke 04's Alessandro Schöpf and SV Werder Bremen's Zlatko Junuzovic also featured. Bayern midfielder Thiago Alcantara started in midfield for Spain in their 8-0 thrashing of European minnows Liechtenstein. Club-mate Javi Martinez and new Borussia Dortmund signing Marc Bartra were unused substitutes. New Hamburger SV winger Filip Kostic was on target for Serbia in a 2-2 draw with Republic of Ireland in Belgrade, netting in the 69th minute to bring the score level at 1-1. Schalke's Matija Nastasic and 1. FC Köln's Filip Mladenovic lined up in defence for the hosts, while Freiburg's Aleksandar Ignjovski remained on the bench throughout. Turkey had Bayer 04 Leverkusen star Hakan Calhanoglu to thank for salvaging an impressive point away to Croatia in Zagreb. Calhanoglu scored a trademark free-kick, albeit with the help of a deflection, on the stroke of half-time to cancel out Ivan Rakitic's opener. Dortmund youngster Emre Mor played for 85 minutes for the visitors, while TSG 1899 Hoffenheim's Andrej Kramaric appeared for the last five minutes for Croatia. Augsburg striker Alfred Finnbogason needed just six minutes to break the deadlock for Iceland in the Ukraine, helping the islanders pick up a valuable point in a tricky away fixture in Kiev in Group I. New Schalke midfielder Yevhen Konoplyanka played the full 90 minutes for the hosts. Three Bundesliga stars played from start to finish for Finland in a historic match against Kosovo, who participated in their first-ever competitive fixture as an independent nation. Eintracht Frankfurt's Lukas Hradecky was in goal, Bremen's Niklas Moisander captained the side and Leverkusen youngster Joel Pohjanpalo all featured in the 1-1 draw in Turku. Borussia Mönchengladbach duo Andreas Christensen and Jannik Vestergaard put in a solid display to help the Danes beat Armenia in their opening Group E qualifier. RB Leipzig's Youssuf Poulsen came off the bench in the second period, while 1. FSV Mainz 05 goalkeeper Jonas Lössl was an unused substitute. FC Bayern München's Robert Lewandowski was amongst the goals once again, scoring from the penalty spot to put Poland 2-0 up away in Kazakhstan in Group E. The home side fought back well, however, and scored twice in the second half to ensure the spoils were shared. Borussia Dortmund's Lukasz Piszczek and VfL Wolfsburg's Jakub Blaszczykowski also featured for Poland. Bayer Leverkusen's Kevin Kampl helped Slovenia fight back from two goals down to take a draw from their Group F qualifier in Lithuania. Hertha Berlin's Peter Pekarik was left heart-broken after England scored a dramatic winner in second-half injury time to condemn ten-man Slovakia to a defeat in Group E.
Hertha Berlin's Vladimir Darida and TSG 1899 Hoffenheim's Pavel Kaderabek both completed the full 90 minutes as Czech Republic were held to a goalless draw by Northern Ireland. FC Bayern München duo Thomas Müller and Joshua Kimmich scored the goals as Germany clinched victory over Norway in Oslo. In total 11 Bundesliga stars featured in the comfortable win as Germany moved top of Group C in 2018 FIFA World Cup qualifying. Scotland topped Group F at the end of play on Saturday after a resounding win against Malta. RB Leipzig's new signing Oliver Burke did not have a hand in any of the goals, but nonetheless impressed before coming off in the 66th minute. FC Ingolstadt defender Marcel Tisserand celebrated his first competitive start for DR Congo with the final goal in his country's 4-1 win over the Central African Republic. The Congolese had only needed a point to qualify from Group B in Africa Cup of Nations qualifying. SV Werder Bremen midfielder Sambou Yatabare opened the scoring as already-qualified Mali thrashed Benin in Bamako. Mali conclude qualification at the top of Group C, having won five and drawn one. FC Schalke 04's Nabil Bentaleb put in a fine performance on his 20th Algeria cap, helping steer the north African country to 6-0 destruction of Lesotho. The on-loan Tottenham Hotspur FC man pulled the strings in midfield as Les Fennecs concluded their qualification campaign atop Group J with 16 points. Borussia Mönchengladbach winger Ibrahima Traore captained Guinea to a morale-boosting, though ultimately futile, 1-0 win over Group L leaders Zimbabwe in Conakry. RB Leipzig midfielder Naby Keita was an unused substitute. Eintracht Frankfurt centre-back Michael Hector played for the full 90 minutes as Jamaica fell to a 2-0 defeat away to Panama in the CONCACAF section of FIFA World Cup qualifying. The on-loan Chelsea FC defender's nation are now eliminated, with four points from five Group B games. Salomon Kalou's Ivory Coast booked their ticket to January's African Cup of Nations thanks to a dramatic 1-1 draw with Sierra Leone. A defeat would have seen the Elephants beaten to qualification by their opponents, but a draw was enough with Hertha Berlin's Kalou featuring for 69 minutes. Paraguay leapfrogged Chile into sixth place in the CONMEBOL section of 2018 FIFA World Cup qualifying thanks to a 2-1 win in Asuncion. FC Ingolstadt striker Dario Lezcano played 82 minutes for the hosts. FC Bayern München midfielder Arturo Vidal - the top scorer in qualifying so far - scored for vanquished Copa America champions Chile, who also featured Charles Aranguiz of Bayer 04 Leverkusen and TSG 1899 Hoffenheim forward Eduardo Vargas. Borussia Dortmund's Christian Pulisic set a new USMNT record with his brace, while Hamburger SV's Bobby Wood also got on the scoresheet in a comfortable win for Jürgen Klinsmann's side. Click here for a match report. Borussia Dortmund striker Pierre-Emerick Aubameyang scored the equaliser as Les Pantheres overturned an early deficit to beat Sudan. FC Augsburg's Ja-cheol Koo got on the scoresheet as the Taeguk Warriors opened Round 3 of the Asian qualifying section with a victory. Koo's club-mate, Dong-won Ji, also featured. FC Ingolstadt 04 forward Mathew Leckie played 85 minutes of Australia's comfortable victory in Perth, with Bayer 04 Leverkusen's Robbie Kruse brought on as a second-half substitute. Borussia Dortmund's Shinji Kagawa, Eintracht Frankfurt's Makoto Hasebe and Hamburger SV's Gotoku Sakai all started the Samurai Blues' defeat in Saitama. Hertha Berlin's Genki Haraguchi and FC Augsburg's Takashi Usami were second-half replacements. FC Bayern München's Thiago Alcantara featured throughout for the 2010 FIFA World Cup winners in Brussels. Borussia Dortmund's Marc Bartra was a 59th-minute substitute, while Thiago's team-mate at club level, Javi Martinez, remained on the bench throughout. Dortmund's Sokratis Papastathopoulos played 90 minutes during the Greeks' victory in Eindhoven. FC Augsburg's Konstantinos Stafylidis and RB Leipzig's Kyriakos Papadopoulos were second-half substitutes for the UEFA EURO 2004 winners. VfL Wolfsburg's Jeffrey Bruma played 90 minutes for the hosts. Dortmund's Raphaël Guerreiro played 63 minutes as the European Champions ran out comfortable winners in their first fixture since lifting the Henri Delaunay Trophy in Paris in July. Dortmund's Ousmane Dembele made his international debut as a 63rd-minute susbstitute for Les Bleus against Italy in Bari. FC Schalke 04's Max Meyer was on target in Germany's 2-0 win over Finland in a game which marked the last appearance in a Germany shirt of former FC Bayern München midfielder Bastian Schweinsteiger. TSG 1899 Hoffenheim's Niklas Süle made his debut in an experimental side fielded by head coach Joachim Löw. Click on the result above for an in-depth match report. Hertha Berlin's Vladimir Darida played the first 45 minutes of the Czech Republic's 3-0 win over Armenia, in which former Eintracht Frankfurt midfielder Vaclev Kadlec scored one of the goals. Former Bayer 04 Leverkusen defender Michal Kadlec appeared in the second half. FC Ingolstadt 04 custodian Örjan Nyland was beaten just once as Norway warmed up for their opening World Cup qualifier against Germany with a 1-0 defeat at home to Belarus. Borussia Mönchengladbach defender Jannik Vestergaard played the full 90 minutes and, together with club mate Andreas Christensen, ensured Denmark did not concede in a 5-0 win over Liechtenstein. RB Leipzig's Yussuf Poulsen came on for the final 15 minutes of the convincing friendly win. Bayer 04 Leverkusen's Hakan Calhanoglu and Borussia Dortmund's Emre Mor started Turkey's 0-0 draw with Russia, with 1. FSV Mainz 05's Yunus Malli coming on for the final half an hour.